93 Harbour Centres - the equivalent height if all Football Foundation funded goal posts were stacked on top of each other. 5 BC Place sell outs – the equivalent number of recipients of Football Foundation funded free kits. 3 Stanley Parks - the equivalent area to all Football Foundation funded pitches. 1.5 Metropolis at Metrotowns - the equivalent area of Football Foundation funded pavilions. Over the last twelve months alone, Foundation funding has helped to deliver 147 community sports facilities, 140 improved goalposts and 2,340 free football kits and equipment for junior and disabled players. A total of 560 grass roots football clubs benefitted from Foundation grants in the last year - not including 223 schools and 148 local authorities. 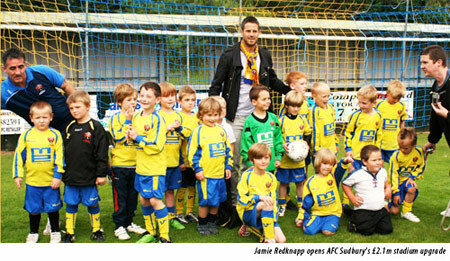 The Foundation’s commitment to the grass roots game has helped cement football as the UK’s most popular sport. We have helped drive the mass appeal of the game to such an extent that in 2009-2010 Football Foundation funded facilities engaged 16,069 volunteer coaches. Our facilities enabled more disadvantaged people to play sport, 20,679 disabled users in 2009-10. Furthermore 16.1% of our facilities usage is from the black and minority ethnic community, a figure which exceeds the national profile. We know that we are having a significant impact. Our evidence suggests that participation increases on the sites that we fund by an average of 50% as soon as they open, followed by a further 25% over the following four years. Furthermore, in the last year alone football participation on Foundation funded facilities increased - on average across all sites - by 10.5%, while multi-sport participation increased by 10.4%. It is important that investment is going to the areas with the greatest need. Last year for example, 61% of our investment was directed into the 20% most deprived wards across the country. All this is assisting the development of the grass roots game and is also lending significant support to the Government’s aim of delivering a mass participation community sports legacy from the 2012 Olympic Games. 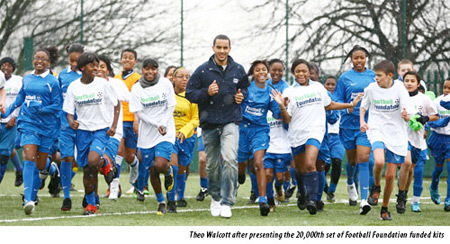 The Football Foundation has been building its own legacy over the past decade. Take for example the £851,855 Foundation Facilities Scheme grant that enabled Worcester City Council to transform the sport facilities at King George V Playing Fields. The site now boasts: six dual-gender changing rooms with showers; match officials’ changing and medical rooms; a kitchen; coach education provisions; meeting rooms; five enhanced grass pitches; and a floodlit 3G artificial grass training area complete with Mini-Soccer pitch. A Saturday Soccer School and a Street Soccer scheme also operate from the site. The Saturday School runs as a stepping stone between school sport and club training, leading to a new Under-10’s club being created and joining the local Mercian League. Members of the local community have been trained as volunteer coaches - all completing their FA Level 1 coaching qualification. Street Soccer is run in conjunction with the local police Community Support Officer and teams run for all ages between 6 and 19. It has helped build up a rapport between the local policing team and the youths, which did not exist previously. Many children from the scheme have also been signposted to local Charter Standard Clubs to play regular competitive football. We are not satisfied with simply building a facility and then walking away. We work extremely hard to ensure that each facility is located in areas with the greatest potential for community use and we check every completed facility, every year, to ensure it is delivering the planned outcomes and ideally exceeding them. The Foundation’s unique approach to monitoring includes annual “Support Day” meetings for every project that has received a grant of over £20,000. Meetings are held alongside Organisations running the projects we fund so as to allow us to give support to them, to dig deeper into how each project is delivering against its development plan and how it could be further improved. Facilities are only part of the equation though - volunteers are the backbone of football in England. They play a key role in Football Foundation projects just like the King George V Playing Fields and are therefore vital in guaranteeing that the Foundation’s investment delivers as much as it possibly can. Foundation data has shown that the performance of a facility is proportional to the number of volunteers they have per team. These results highlight the need for the volunteering element of any project to be taken seriously, as oppose to an optional extra. A solid volunteer structure can be the difference between the success and failure on the pitch, on the balance sheet and in the community. Ultimately it is the Foundation’s unique ability to turn critical investment into much much more and a capability to leverage further funding from other sources that allows us to provide such huge investment. Over the past ten years, the Foundation has managed to secure an additional £526m over and above the £407m direct investment made by our funding partners. Foundation partner’s investment is not just improving the comfort and safety at community sports sites, it is also massively increasing capacity, enabling more people than ever before to play football and other sports regularly. This, in turn, drives up participation whilst helping to improve the nation’s health. 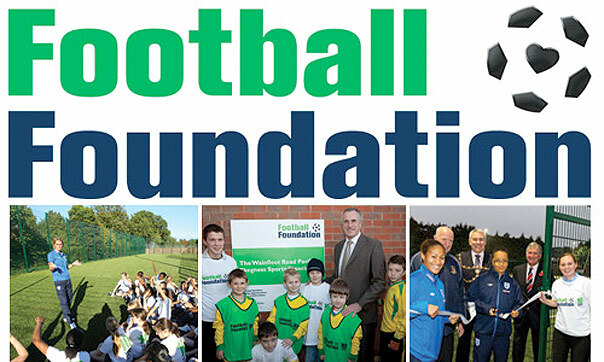 To find out more about all the different funding schemes that the Football Foundation offers, or to apply online, please visit www.footballfoundation.org.uk. Niall Malone is the Football Foundation’s Public Relations and Communications Officer. He has previously held customer care, marketing and media and communication positions at Tottenham Hotspur FC, AFC Bournemouth, the Vancouver Whitecaps and at Deltatre Media.